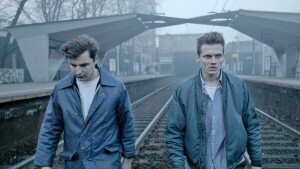 I recently spoke by phone with Polish filmmaker Michal Marczak on the occasion of the recent theatrical release of his 2016 Sundance-winning documentary hybrid feature All These Sleepless Nights (which I reviewed last year). A beautifully shot, elliptical meditation on post-college malaise, the film uses ostensible non-actors (we learn more about this in the interview, below) playing mostly true versions of themselves. Neither entirely fiction nor nonfiction, the movie is part of a new wave of films that defy genre classification. I did not re-watch it before our conversation, but remember being simultaneously entranced by its mise-en-scène and disappointed by some parts of its content (what is new in feeling lost after graduation?). Here is a condensed digest of our conversation, edited for clarity. Hammer to Nail: When I saw your film last year for its Sundance release, it was pitched as a documentary, and in fact it won a Directing Award for World Cinema Documentary at that festival. If go to IMDb right now and look up your film, there is no clear genre designation. How would YOU describe your movie? Michal Marczak: I like that there is no clear genre designation, and would like to keep it that way. I think that some films are easy to label, and it’s good to label them, and I think some…you know, honestly, I can’t answer that question. I don’t know. It was a conscious choice to have it premiere in the documentary competition at Sundance and start its life there, because I think the film is very much tethered to reality and to me it is definitely a documentary about the emotions of youth and what it means to be young. I think it really has to come down to what is your definition of a documentary; the philosophical concept behind it. Many, many people have told me that that is exactly how their life is, in Warsaw. And I feel that I did a good job capturing what I was noticing and seeing around that time and turning it into a cinematic language. How do you express emotions or beautiful things like physical love? How do you put them in a documentary? You can have the characters tell it to the other characters, but it doesn’t make you really feel it. This film was supposed to appeal more to the heart than to the brain. So it depends what your definition is. HtN: Well, we’re in an age of hybridity, as far as documentaries go, so I’m not, myself, pushing for a definition. I was just curious how you thought of your film. It’s interesting that you talk about how people in Warsaw have come up to you and said that your film represents what they experienced. As much as your film is clearly grounded in Polish life, it still feels very universal. We have the specificity of Warsaw, but it could almost be anywhere, in terms of that post-college, twentysomething angst. It’s not uniquely Polish, in some places, though in others it certainly is. Do you see it as speaking to something beyond the Polish experience? MM: Yes, of course. What I meant is that, from the perspective of a documentary, and the Polish people, it does really capture those situations and people, although some of the details in their life have been changed, even if, overall, the bigger picture fits. That having been said, the things that the characters are going through are completely universal: the quest to see who you actually are; experimenting with different versions of yourself; making mistakes and having epiphanies and coming up with things about yourself that have been discovered hundreds of times before in every generation. Those are universal things, and definitely the stuff that I wanted to concentrate on. HtN: Sure. So, I haven’t seen either of your two other features, I confess. Are they equally as hybrid as All These Sleepless Nights? In this film, we definitely feel your hand as the director, particularly in your camera work. Is that a new approach for you, or did your other films anticipate this kind of style, as well? MM: I think they did. That was what drew me, from the very beginning. I try to trace it back, maybe to Wayne Wang and Paul Auster in Smoke and Blue in the Face. Those were films I saw when I was 15, and I couldn’t really read up on how the films were made, so I had to come up with my own story. I saw these films back to back, and the second one felt as if was kind of improvised and done quickly off the cuff, but it had the same characters and the same situations. So, in my mind, I created this idea that it was done by this really close-knit group of friends who did this narrative film and then went off and did something that was built around their own lives, but at the same time they added something to it, and it just played so well. It has this amazing energy, which I think they must have had during the shoot. And I think that was something that really stayed in my mind, and I thought that was the most interesting avenue to film reality, to also heighten it. On the other hand, I really hated the kind of standard docs, just because I felt that they’re saying too much and not really appealing to the emotions and not leaving enough space for the audience. But reality is so interesting. So, I think, from the start, I wanted to have both worlds, to have the reality and the sense of adventure in going into new avenues and having real people, with real emotions, going through real situations, and being able to go on that journey with them. At the same time, I wanted to utilize everything that cinema has taught us to be able to push certain things in a cinematic way, to leave more things up to the viewer to decide. When you think of documentaries, they’re actually quite limited in their storytelling capabilities compared to the tools you have in fiction. And somewhere I felt that the combining of these two worlds is where there is that sweet spot. And also, as a filmmaker who is just starting out, documentary is cheap, with no one looking over your shoulder. It’s such small money that you can go off and do whatever you want and deliver the film when you want. HtN: So how did you choose, or cast, your subjects? Did they ever feel uncomfortable at the level of intimacy between themselves and the camera? How much did you actually direct them, since they are, ostensibly, real people living their lives? HtN: Right, they were already used to riffing on their own experience. MM: Kind of, yeah. And also sharing it with a wider crowd, so becoming vulnerable in front of a wider crowd. HtN: So, in some way, we’re seeing a filmed version of one of their performances, but with your own additions. MM: Yes, but it was done over a year and a half, so sometimes the additions were minimal, and sometimes they were quite large. But everything that happened was plausible that it could have basically happened to them. Maybe it wouldn’t have happened over the course of the year and a half, and maybe it would be less intense, or more intense. Who knows? But I think it’s all from the realm of the possible. HtN: Sure. It’s definitely a fascinating approach, and as you alluded to earlier, at one point the camera is right there while two characters are making love, so you’re definitely intimately embedded – in this case, literally – with your characters. It’s definitely engaging. Speaking of that, what I love most about the film is the camera work, which most reveals your active directorial point of view. I see you’ve shot a number of other films, beyond your own. Do you intend to continue DPing [working as a director of photography], as well as directing? How do you see the relationship between the two roles? MM: I don’t think I’ll DP much for other people. I never set out to become a DP. I’ve always kind of felt that I have to know everything, because I’m doing this small-scale cinema, so I have to be ready to do everything, myself. I did my first film with a cinematographer, but then, you know how it is, you’re really tight with deadlines, and so…And also, you’re working in this sort of intuitive way, and by the time you communicate something – even if you have an amazing relationship with a cinematographer – you’re losing something. Plus, I have this thing where I would constantly take the camera, because looking at reality through the camera, from that perspective, puts you in film world. So that’s how it came about where I just had to frame it, myself; I have to resonate with the characters. But on this film, we had another cinematographer, who shot some of the scenes, but I think a lot of the intimate stuff, it was just very intuitive, and I kind of just knew where we should be going, because I spent so much time with the characters and go to know all of their idiosyncrasies and how they move, so I could anticipate their moves and their psychology, kind of. So that’s something that allowed me to shoot these scenes with just one camera and get all the coverage. Plus, I also edit a lot, too. I mean, I work with a great editor, but we’ve been editing for a long time, and I edit a lot of the scenes and pre-edit a lot of the scenes, keeping the images in my head. I think that a really important skill for the cinematographer is to be an amazing editor, when you’re working in this technique, and that’s very difficult to come by. You really have to keep in mind everything that you have, as coverage, to be able to film something that may not look good but actually edits, at the end of the day, because that’s what gives value to these images, that they lead up to a story. And also, I really like that I can direct while we’re in the scene. I can touch someone with my foot, or with my hand, or whisper something, while I’m shooting. We have all these little cues – these nonverbal cues – that we feel, like “move to the light,” or “say this again,” or whatever, but we’re doing it while we’re still in the moment of shooting this scene. So, I don’t have to put down the camera, give direction, take the camera back up, all of which usually takes away so much energy. Because I can do all this and direct at the same time, and then film something that I need for another moment, that allows us to continuously go and not really get out of the emotions. HtN: So along those lines, what did you shoot on? What camera were you using? MM: The Sony a7S. We built a special rig for it by ourselves. We had a really cool engineer working with us, and the rig was built from the ground up using stuff that was available on the market at that time. And I actually just checked, recently, the official rigs, and the stuff is either too bulky or too heavy, because it’s all designed with the idea of just doing one take and working with assistants: somebody pulls focus, somebody picks up the rig from you after you’re done with the shot. Whereas the idea was that when I go out shooting, I have everything and I control everything – the focus, the gimbal, the computer – and I have everything by my fingers and it’s all hooked up to a backpack. And the ergonomics of it, to be able to achieve those weird angles and to have the camera flow and to be able to switch the modes of shooting. So we put a couple months of work into creating the gear from scratch and doing extensive tests, figuring out lenses and lens changes that would be super-fast and wouldn’t require re-balancing and so on and so on. HtN: Fascinating. And the a7S is nice, small camera, very sensitive in low light, so that would work well in all sorts of situations. MM: Yeah, it was really awesome. The trick was really the gimbal, that stabilized it and gave it that flow. And then really, really complicated color correction: hundreds of layers and everything. Because it’s a good camera, but it’s also not. (laughs) But I tried with the RED and it was just impossible; it’s just too heavy and bulky. Some of those shots would just not be possible. HtN: Well, your film is definitely quite beautiful, visually. So excellent job there. HtN: Great talking to you! MM: Thank you very much!